Albany’s Ellsworth Street Bridge dates from 1925 but has been kept in good shape. We are hearing a lot these days — most recently on CBS’s “60 Minutes” on Sunday — about the sad shape of the highways and bridges in this country, and how politicians in Congress are refusing to raise the gas tax to fix this failing “infrastructure.” Maybe more could be done if we found a way to cut the amount of money and time that this work takes. 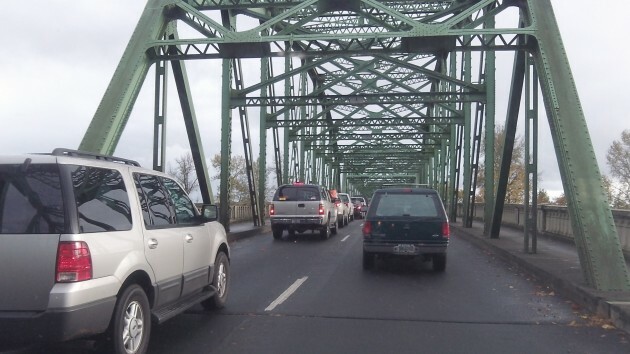 You have to wonder how people especially in Oregon paid for all those magnificent bridges we have today and built them in just a few years, at a time when the state’s population and gas-tax-paying drivers was a fraction of what it is now. President Eisenhower signed the bill providing for the interstate freeways in 1956. The act raised the federal gas tax from 2 to 3 cents per gallon at a time when America had about 170 million people and maybe half that many motor vehicles. Now we have about 320 million people, most of them with a car, and the federal gas tax is 18.4 cents. Even though vehicles are more efficient, they are also far more numerous and are driven much farther than 60 years ago, and yet the federal Highway Trust Fund is running on empty. So where is all that tax money going? Much of it, I suspect, goes into processes that don’t result in actual construction or repairs. And some goes into construction projects whose costs have become astronomical. Last year, Oregon completed a new Interstate 5 bridge across the Willamette River in Eugene, the “Whilamut Passage.” It cost about $204 million, but that included expenses other than the $150 direct construction costs. This new bridge replaced an I-5 bridge that had been constructed in 1961 at a cost of $2.3 million, according to the Eugene Register-Guard. Yes, inflation — obviously. But we now spend many years on planning, public involvement, environmental reviews and consultations with stakeholders including Indian tribes and artists and so forth. And all of it costs money. Meanwhile, closer to home, ODOT has spent several years trying to eliminate a 10-mile, looping segment of Highway 20 west of Eddyville by constructing a 5-mile shortcut. 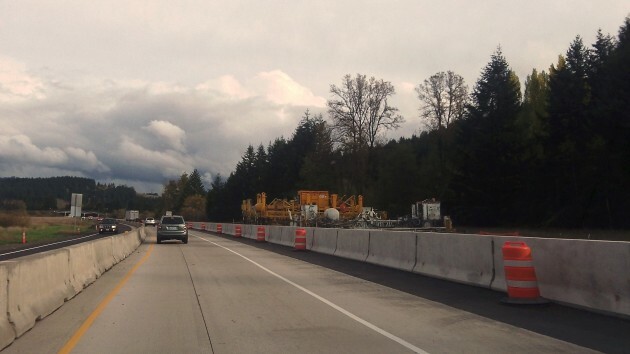 Unforeseen landslides caused all kinds of delays, and ODOT now plans to have that road finished in 2016 at a total cost of about $366 million. For that amount of money, motorists are going to save about 10 minutes on the drive to the coast. Is it worth all that money? I-5 south of Cottage Grove was being rebuilt this year. I have many of the same thoughts as I drive or ride my bike around the mid-valley.How in the world did past generations pay for all the infra-structure that today we can’t seem to afford to repair.It seems that companies, the few that are big enough to bid on large projects, see public works as a golden goose. A number of years ago, a truck hauling a piece of heavy equipment hit and bent the crossmember clearly visible in the picture above. To the best of my recollection, the repair cost…afraid to quote a figure here as I know Hasso will research it…was in the six figures and took just a few days to complete.More than the price of a house that takes months to build. We are regulating ourselves into oblivion. it is done at all levels of government, people of good conscience making rules without a thought to the future consequences of their actions. We demand that people be paid far higher for public projects than they are paid for the private project next door, doing the exact same work. We allow one government agency to use our money to fight another government agency in court and WE pay for both agencies and the fight and it many times is not what we wanted to begin with. OK off my soapbox now. Very true. You need look no further than Albany to see irate conservatives demand that replacement of police and fire facilities be put to a public vote. These are the same people that scuttled the last bond, because they didn’t get to formulate it themselves. The machinery of government is generally designed to allow elected officials make the decisions and move forward. In our politics these days that is unacceptable because a segment of the population regularly tars government as inherently bad, and they make little distinction between the federal government and the city. While regulations have clearly made costs go up, they have also helped minimize sins of the past. Salmon runs are less endangered because of in-stream construction in the migration season is no longer allowed. There’s no such thing as s free lunch. Whether its regulations or endless demands of public votes on every issue, they all cost money. And our air and waters are vastly cleaner then they were when I was a child growing up, and I’m thankful for that. Bob, you wrote: “….. irate conservatives demand that replacement of police and fire facilities be put to a public vote.” Tell us, do you have a better alternative than voting on bond measures? Perhaps you prefer the executive decree, as King Barack has done at the federal level? And next time leave out the word “irate.” There are a plethora of adjectives I could use toward liberals/progressives, or whatever “politically correct” label people of your ilk prefer these days. Myopic is the first that comes to mind and will do nicely for this discussion. .
First, that a significant portion of the population views government with skepticism is hardly new. Our founders used that skepticism when drafting the Constitution to LIMIT government power. To your second point, don’t insult people just as intelligent as you fancy yourself to be. Believe me, we know the difference between the federal, state, and local levels of government. Perhaps you need to recognize that it is at the local level where our votes count the most and where our individual voices can be best heard. Counselor Kellum is correct when he says we are regulating ourselves to death. Construction costs have outpaced inflation considerably, almost entirely because of regulatory requirements and costs to do almost anything these days. Many of these regulation are not much more than job security for bureaucrats and there is a significant amount of redundancy between state and federal agencies. Yes, I’m aware that elections cost money…and that there is no free lunch. So is everyone else. And if we are again presented with more or less the same proposals, voters will likely deliver the same result. I think bidders are required to pay “prevailing wages” or some such definition which really means UNION Wages. I’ve noticed the “Putting Oregon(ions?) To Work” signs on some projects, in which it seems most are won by out of state contractors that don’t have as many hoops to jump through as Oregon owned businesses. The Davis-Bacon Act of 1931 requires contractors doing work on federally funded public works projects (including subcontractors) to pay their employees the “prevailing wage” in each construction specialty. This “prevailing wage” varies by trade and is tied to the currently negotiated union hourly rate PLUS the current benefit package negotiated by each trade union in each union jurisdiction. In other words, a prevailing wage rate in say, Colorado may be different than in Oregon. The act does NOT require that contractors be signatory to the union(s) but non-union employees, by law, must be paid the union hourly rate PLUS the hourly “fringe (benefit) rate” for each hour worked. The prevailing wage varies by trade and union jurisdiction and is calculated by where the project is built. These rates are carefully spelled out in all contract specifications for each project, ensuring a level playing field in the bidding process. Incidentally, Oregon law requires that the low bid be accepted with few exceptions, and a contractor’s failure to enter into a contract after being the successful low bidder will usually result in forfeiture of their “bid bond” (10% of bid $), also required to bid, by law, to ensure responsible bidding. Additionally, a “performance bond” is required to enter into a public contract to ensure the general contractor completes the work according to the plans and specifications (plus change orders), also referred to as the contract documents. These rules apply to general (primary) contractors and usually do not extend to their subcontractors because subcontractors are under contract to the general contractor and not to the public agency directly. General contractors alone are liable for the performance and bid integrity of the subcontractors they use. These requirements have been in place for many, many years now. For example, a journeyman carpenter working on a bridge project (Zone 1 – Group 5 concrete forming and placement, etc) would be paid the hourly rate of $34.44. If the worker belongs to the Carpenter’s Union he/she would receive the union fringe benefits package as compensation (currently valued at $14.83 per hour). If the worker was a non-union employee, he/she would receive the “fringe rate” on his paycheck IN ADDITION to the hourly rate for a total of $49.27 ($34.44 + $14.83 in lieu of the union benefits) per hour on their paycheck. The State of Oregon adopted the “Little Davis-Bacon Act” in 1959 for state funded public projects. This applies to all publically funded projects in Oregon, be it state funded or locally funded (city, county, school district, etc.). The information on this link provides the reasoning for the law. I hope this erases some of the confusion and misconceptions of prevailing wage law. No matter how one feels about these public contracting laws, It’s hard to blame Davis-Bacon for the rise in construction costs because there has been little change in these laws for decades. They may be held “to the same standards”, but having their offiices in Washington state lowers their cost to DO business and they win the bids.